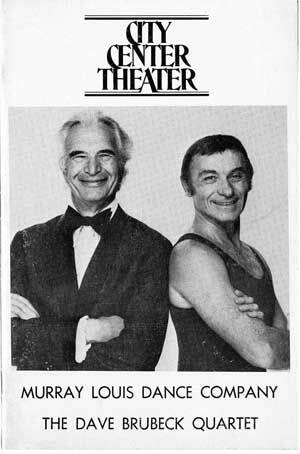 From Janis Brenner and Dancers — We were saddened by the loss of the great artist and humanitarian Dave Brubeck. As most of you may know by now, the jazz giant passed away on Wednesday, December 5th, just shy of his 92nd birthday. We mention this not only to acknowledge Dave’s passing, but to express a personal side to this recent news. Janis had the life-altering experience and honor of working, playing and touring with the Dave Brubeck Quartet as a member of the Murray Louis Dance Company in the mid-1980s. Almost thirty years after the February 1984 City Center premiere of Four Brubeck Pieces (program on the left), the Juilliard Dance Division, in collaboration with the Jazz Division, will revive and premiere the 2013 version of the work. After an exciting year of putting all the components together between Murray Louis, Alberto del Saz (Co-Artistic Director of Nikolais/Louis and restager of the work), Larry Rhodes (Director of Dance at Juilliard), Russell Gloyd (devoted, long-time manager, arranger and conductor for Brubeck), Dave and Iola Brubeck, and Carl Allen (Director of Jazz at Juilliard), Janis’s dream was to see Murray and Dave reunited after 23 years, taking a bow together on opening night, April 3, 2013, at the Peter J. Sharp Theater. Now the April 3–7 performances will not only honor the genius of Murray Louis’s and Dave Brubeck’s dynamic collaboration but will also serve as a tribute to Dave’s legacy. A heartfelt toast to Brubeck’s glorious life, music and family.